Garmin's most basic fitness tracker is back for a fourth edition with the – you guessed it – Vivofit 4. This sits at the very opposite end of the range to the Fenix series, Garmin's expensive, feature-packed sports watches. As we all know, cheaper trackers have eaten into the wearables market significantly – just look at what Xiaomi's doing. The Vivofit 4 costs $80, which feels right for what you're getting, and it's strategic pricing from Garmin to get on more wrists. This isn't going to perform the heavy lifting of the best sports watches, nor does it do notifications, which is something we've seen more and more fitness trackers handle. The Vivofit 4 is all about your daily fitness tracking, and it's no slouch in that department. I've been testing it out for a little over a week. Here's the verdict. The Vivofit 4 isn't much on the eye, but Garmin is offering it in a variety of colours including standard black (which I've been using), plum, limegreen-speckled black, and white – but not all are available in every size. Even when jazzed up with some of those speckles, the Vivofit 4 still looks pretty cheap. The only thing that breaks up the textured rubber band is a small screen and single button in the middle. Pushing that button will cycle through key stats like steps, calories, distance, standing hours, but you can also see the weather and temperature. Oh, and there's a "custom widget" that will display a message of your choosing, but I'm not sure what the point of this is. Remind myself to buy milk? There are probably easier ways. Having a single button and no touchscreen makes things more tricky when you want to manually start an activity or sync with your phone, as this requires one long push and then a few more taps to scroll through the options – and then another long push to select. It's probably the best way of doing things given the constraints, but it's a bit fiddly, and annoying when you accidentally go past the option you were trying to get to, and have to go round again. Don't get too excited by the display; it's a small 8-colour MIP screen with an 88 x 88 pixel resolution, so there's not a lot of room to display information. But it's fine for glancing at the time or quickly checking your goal progress. I do like how you can choose different widgets to show during exercise than when you're not in an activity, and all of these can be added/removed/reordered as you wish. There are different clock faces to choose from, too. The band is comfortable to wear, and that's super important when you've got sleep tracking packed in too. I've been wearing it to bed for a week and at no point have I had an urge to throw it off (which I have with some other fitness trackers). It's also waterproof with a 5 ATM resistance rating, so fine for showering with or taking in the pool. It won't track swimming metrics (though it can measure your calorie burn), but Garmin's delivered a wearable here that really can be worn 24/7. As has been implicit so far, the Vivofit 4 is pretty stripped back in the fitness department. It doesn't have GPS like the Vivosport, nor does it have a heart rate tracker like the slightly more expensive Vivosmart 3. The latter is perhaps more surprising as these sensors are finding themselves in a lot of lower-end trackers these days. But these features are also double-edged swords in that they drain battery life, which is the Vivofit 4's strongest suit: you'll get a year of charge before needing to replace the batteries. So what does it track? Well, steps and calorie burn, naturally, along with what Garmin calls "intensity minutes", which is calculated by tracking your steps per minute (in lieu of heart rate data) to track the times during the day where your movement is a little more vigorous. You can also use the Vivofit 4 to track runs, either manually by scrolling to it in the settings, or by configuring auto-tracking in the app. This leverages Garmin's Move IQ tech, and you can set your threshold for the amount of time doing an activity before the Vivofit 4 starts tracking it. So once you've been walking for, say, 10 minutes, your activity time will show on the tracker display (also accounting for the 10 minutes before it kicks in). This goes for both running and walking, but those are the only two activities that can be tracked here. Once you're done and you sync with the app you'll see your activities broken out in your dashboard, and the time between ending a run and seeing it in the app is a matter of seconds. 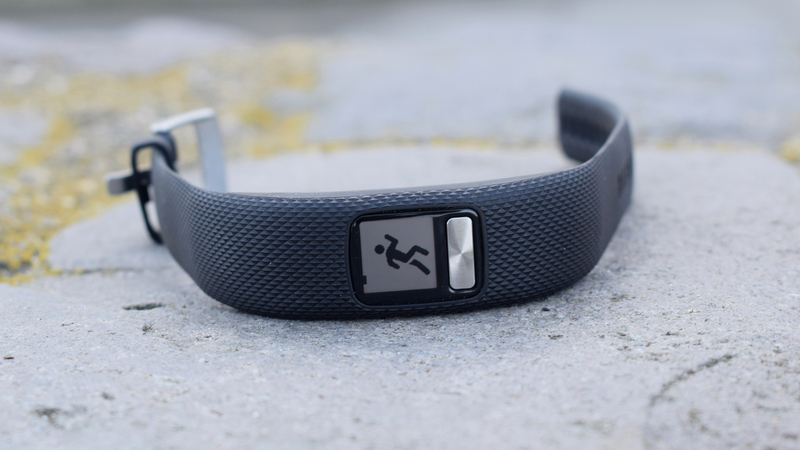 I've found accuracy to be good here, with no problem detecting when I've started – and stopped – walking or running. The biggest problem I've had with the Vivofit 4 is accuracy when tracking my distance, which is no surprise when you're lacking GPS. As you can see in the run below, which was done with the default stride settings, the Vivofit 4 (shown right) undercounted by a small margin. The good news is that you can customise your stride length in settings, which does improve matters. Still, it's never going to be as good as using GPS. Sleep tracking is about as accurate as I'd expect for a device like this. It's all guesstimation based on movement, as without heart rate data it's more difficult to know what state your body is in and how you're moving through the different stages of sleep. It's been pretty good at tracking my hours of sleep, though on one night it oddly came up with nothing at all. It's really far from perfect, so if sleep tracking is important, I'd advise looking elsewhere, but it's competent enough to tell you if you're severely lacking in hours of sleep or waking up a lot in the night. Perhaps the most appealing feature of the Vivofit 4 is that, as mentioned, it has a year-long battery life, running off two SR43 batteries, so you won't need to plug it in to juice it back up. (Embarrassing story: When I took the Vivofit 4 out the box I spent a good minute trying to figure out how it plugged in, before remembering that it doesn't need to be charged and that I was an idiot). Granted, it's not doing the heavy lifting of a smartwatch, nor is it drained by GPS or a heart rate sensor, but the fact it can run a screen and track activities for a year is still impressive. Syncing to the app requires two long presses on the Vivofit's button. Thanks to some recent improvements you'll get a nice colourful breakdown of your activity on the dashboard when you open the app, including your most recent workout highlighted at the top. Further down it will show your stats from the previous day so you can see how you're faring, and a breakdown of the last seven days of your daily averages. Everything is nicely signposted so you can take in the information without too much studying. It's also in the app where you can choose the widgets you want to see, the clock face you want, and which metrics you want on display when running. And if it gets any workout or sleep data wrong, you can edit them here too. But no cheating! The Vivofit 4 is all about hitting the basics, and does so competently. The year-long battery life is a big pull and Garmin's MoveIQ exercise tracking works well, even if the lack of GPS means accuracy could be better for runners. For everyone else this will all be enough; if it is a basic, affordable tracker you're looking for, the Vivofit delivers at a reasonable price.